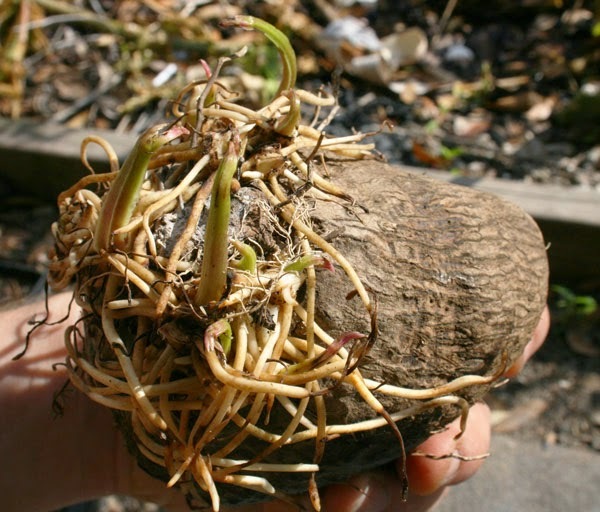 Florida Survival Gardening: Propagating yams from "minisetts"
I've written before on edible air potatoes and recorded an episode of Crash Gardening on them as well. Though some "air potatoes" are considered invasive, there are also varieties that are not on any lists, such as the "name" yams you can buy from the ethnic markets. I bought a "white name" yam some months ago, then forgot about it and left it in its plastic bag in a dark corner. Interesting, is it not? 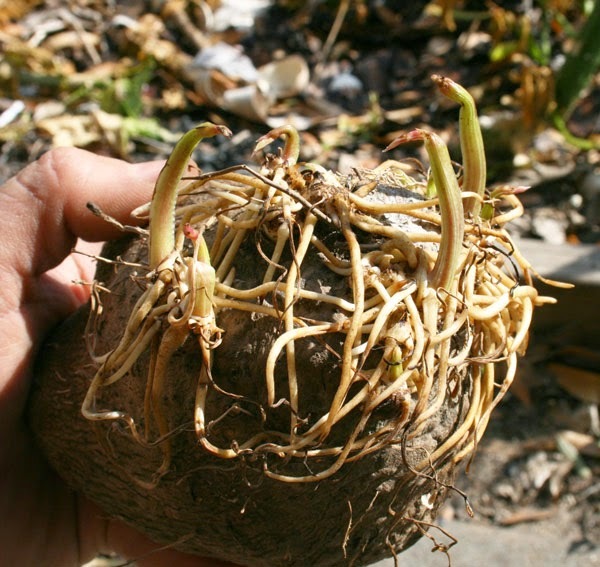 That thing popped out roots and sprouts from over a half-dozen nodes on that formerly eye-free tuber. I had done some research on true yams before and read that they could be propagated by cutting a root into pieces but I didn't quite believe it until I saw how the vines emerge all over the place. After finding this yam, I also found this video on YouTube. I wish I could speak Hindi, but you get the idea. I particularly like how they prepare a special bed to get their yams started before transferring them to the field. 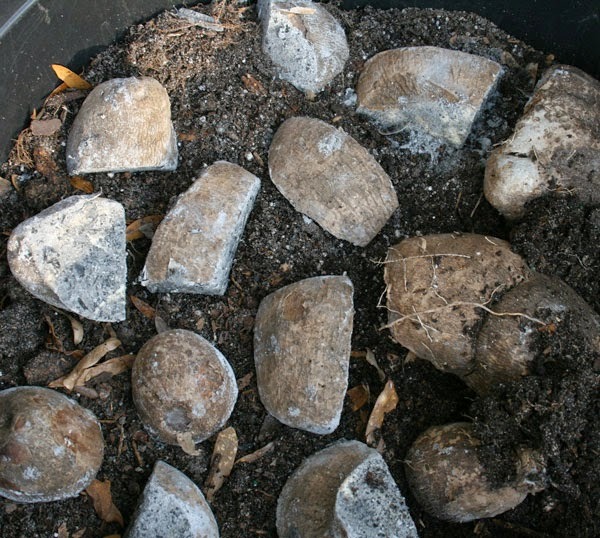 Since I already have a bunch of yams planted in the ground, I figured I might as well give it a go and cut this one and another still-dormant root to pieces and plant them. 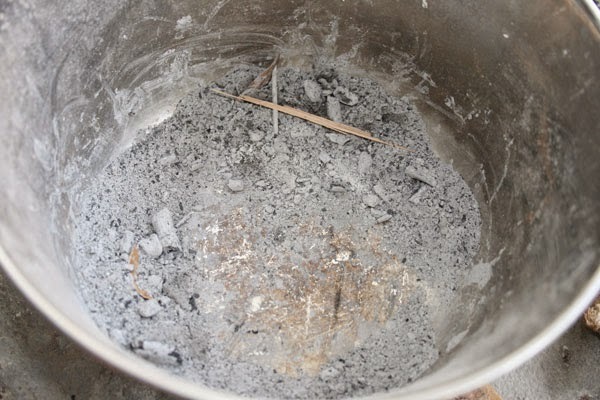 To help seal the cut surfaces and keep out infection, I burned a bunch of sticks in my Stovetec rocket stove one evening, then collected the resulting ashes the next day. 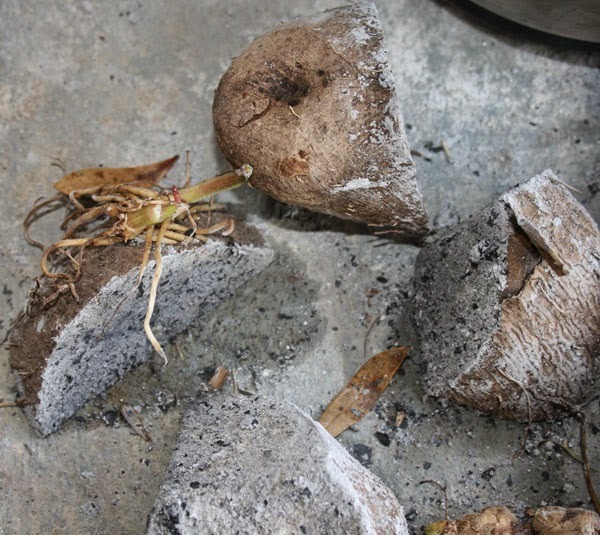 (At the point I took this photo, I'd already used a bunch of the ashes covering the cut surfaces of a batch of ginger I was propagating). All the pieces were dipped in the ashes and spread out to dry for a while. Then I placed them all in a huge pot. 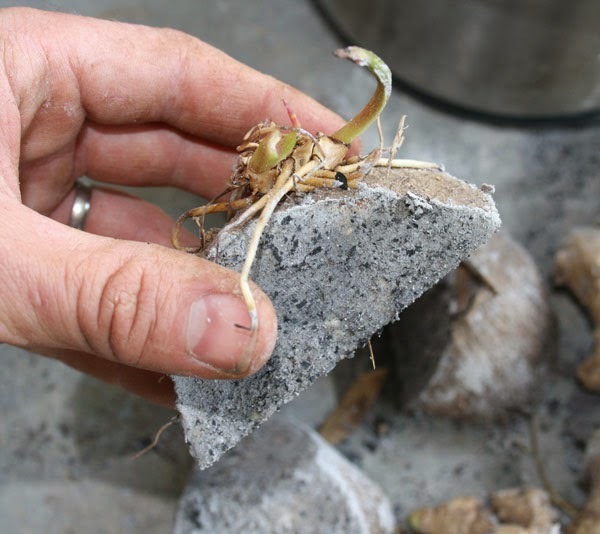 After spreading them out, they were covered with two inches of potting soil. When they sprout and I plant them out, I'll take more photos. ...so I had to try it. Unlike white potatoes, they don't have any visible eyes when dormant so I've hesitated to cut them up in the past. No longer. It's yam time. I am wondering if this is a way to start sweet potatoes? They generally seem to sprout only from one side in my experience. I prefer to bury a bunch of them on their sides in a flat on the back porch and keep them watered, then break off the emerging shoots and plant them out. What is the purpose of the ashes? To help seal the cut surfaces and keep out infection.